Hello everyone and welcome to this week's edition of What I Am Reading. Today I am reviewing Vampire Morsels by Joleene Naylor. To those of you that follow my book review blog, you will notice that the author's name sounds a little familiar. This is actually the second book that I am reviewing by Joleene. A couple of weeks ago, I had reposted my review of Shades of Gray, which is book one in Ms. Naylor's Amaranthine Series. 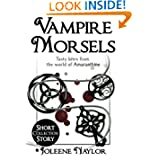 If you are not familiar with Joleene's work and find the prospect of starting a 6 (going on 7) book series a little daunting, then I highly recommend reading Vampire Morsels first. This collection of short stories gives the reader an excellent glimpse into the world that Joleene has so intricately woven. These 'back stories', if you will, center around some of the lesser characters that you will find in the first two books of the series: Shades of Gray and Legacy of Ghosts. In addition to Vampire Morsels, I am also using this week's edition of What I Am Reading to throw a quick blurb about 101 Tips For Traveling With a Vampie. Oh! Some exciting news! As I was copying this last link to 101 Tips, I noticed that Ms. Naylor is currently giving this book away for free! So, be sure to follow the link and get your copy today! Thanks DM :-) Its nice to see you around here again. Thanks Maggie :-) Hope you can check out this week's review of The Cartel by E.G, Manetti. No problem, Joleene :-) Thank you for writing such awesome vampire stories!